Transfer your whole photo library all at once. Export photos to computer, saving more free space. Import photos from PC/Mac, without erasing original library. Display full-screen photo slideshow automatically or manually. 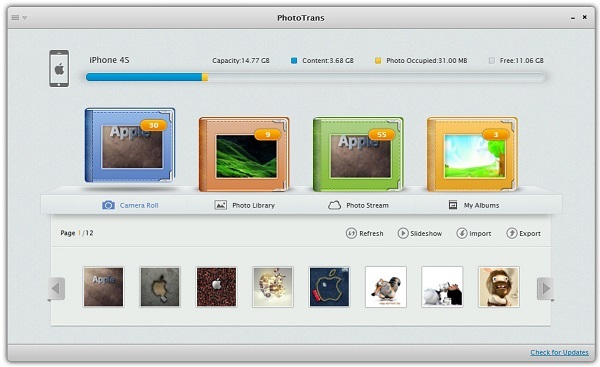 PhotoTrans is useful from iPhone, iPad and iPod touch users who capture a lot of photos with the mobile devices, and do not want to install iTunes to sync, yet want an easy and convenient way to download and manage the photos on the iDevice. Check out the video tutorial of PhotoTrans, which shouldn’t be needed as it’s simply easy to use and master. PhotoTrans normally costs $39.99 to purchase. Now for a limited time, the developer is giving away the license code for PhotoTrans version 1.5.0 for free. Just head to the giveaway page to download the setup installer, and then use the following license code to activate the software: RQPN-NHJE-ELVW-CEEP-NAOM. iMobie PhotoTrans supports both Windows and Mac.